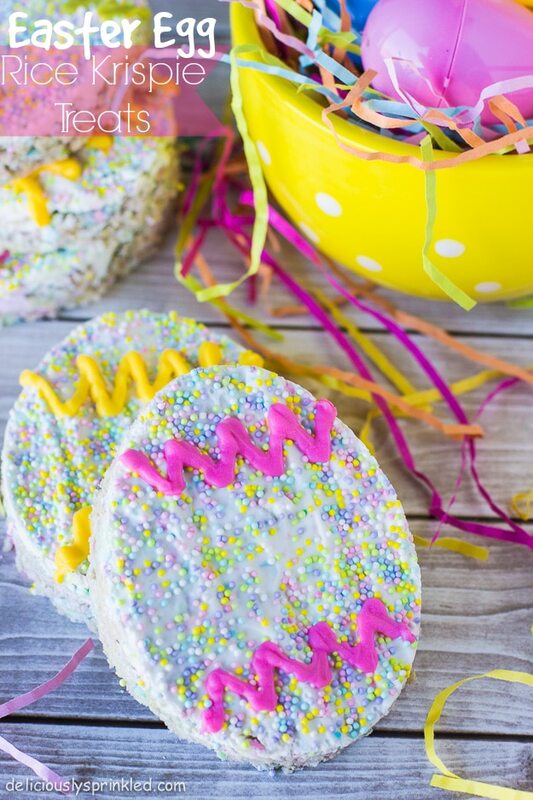 A classic rice krispie treat made with Peep marshmallows, covered in white chocolate, and shaped into an Easter egg decorated with SPRINKLES and candy melts for a fun Easter treat! It’s that time of year…time for Peeps! Peeps seem to be one of those candies that you either LOVE them, or you HATE them. Personally, I love them. So fluffy and colorful, kind of like SPRINKLES, Peeps just make me happy! And these rice krispie treats make me even happier! They’re made with melted colorful Peeps and rice cereal, and covered in bright white candy melts. I used a egg shaped cookie cutter to shape them into Easter eggs and decorated each krispie treat with SPRINKLES and pink, yellow, and lime green candy melts. Perfect Easter treat for the kids of all ages! These are so delicious! 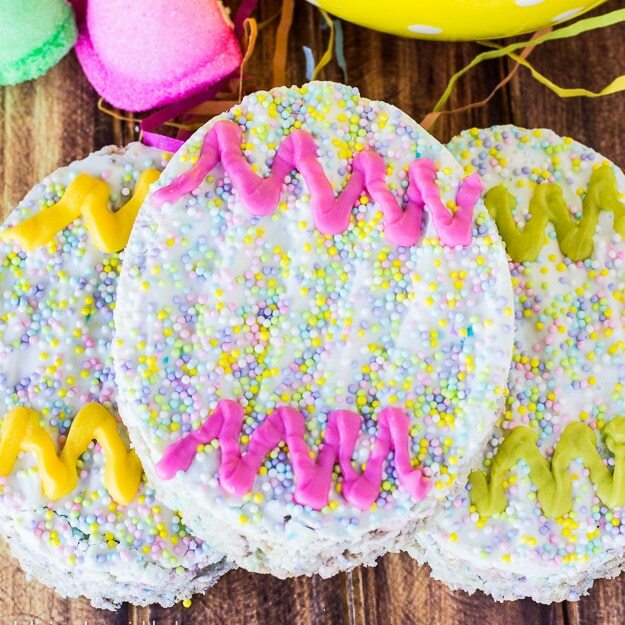 They taste just like original krispy treats just a bit sweeter, with a whole lot of Easter spirit! If you’re looking for a quick, cheerful treat to make this Easter, or Spring for that matter, give these a try. Hopefully they make you smile too. In a large pot, melt butter over low heat. Add marshmallow chicks & bunnies and melt in separate color sections within the pot (see images above). Do not MIX colors! Add rice cereal. Stir until well coated. Evenly press mixture into 13 x 9 x 1 1/2-inch pan coated with cooking spray. Cool completely. Once cooled, melt bright white candy melts and spread on top of the rice krispie treats, immediately sprinkle with colored sprinkles. Place in fridge for 10 minutes to set the candy melts, once set using a egg shaped cookie cutter cut into desired egg shape. In 3 separate microwavable bowls, melt bright pink, yellow and lime candy melts in the microwave for 30 seconds, stirring until smooth. Pour melted candy melts into separate storage baggies and cut a small hole at one end to form a tip to decorate Easter egg rice krispie treats. let sit for 5 minutes to allow candy melts to harden before serving. Very cute and festive! 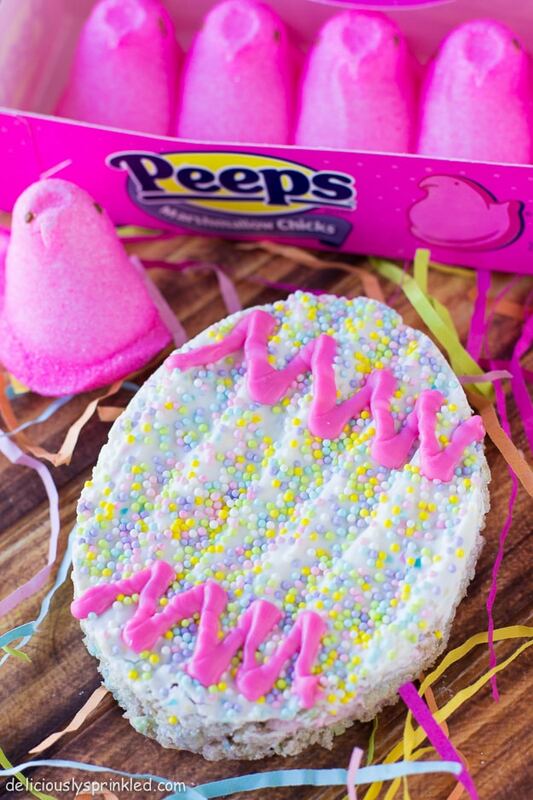 Even though I’m not a Peep lover, I’m sure I’d love them in the form of a Rice Krispie Treat! I like that you took a basic treat and made it unique. Good idea! These are so fun and super cute! Love the colours! These have a SERIOUS adorable factor! !